On a boat sailing through the still waters of the Noi River, a tributary of the Chao Phraya River in Thailand, Miura-san, a senior male engineer from a Japanese engineering consulting company, grows increasingly excited about the legendary Dutch irrigation engineer Homan van der Heide, who designed the basic plan for the entire water infrastructure of the delta in the early 20th century (Ishii 1978). At the moment, we are traveling in the dense and complicated network of watercourses in the western part of the upper Chao Phraya Delta. Here a maze-like network of small channels connects the Noi with the Chao Phraya. Although this entire delta area has long been the object of human intervention, the dense vegetation on the banks and meandering watercourses seem far from an artificial landscape. Miura-san is comparing these seemingly chaotic channels with the map in front of us (figure 1). More precisely, he is comparing the canal network of the eastern bank of the Chao Phraya River, whose tributaries appear orderly and grid-like on the map, with the labyrinthine watercourses of the western bank, where we are traveling. The delta, which has been cultivated to become these two contrasting areas – the carefully ordered network of canals of the Chao Phraya’s eastern bank, and the more chaotic waterways of the western bank – is especially effective as flood management systems go. The maze-like network in the west functions as a huge retention zone to store excess water, protecting the canal grid on the opposite bank. Thus, Miura-san was doubly impressed, both by the skill of the Dutch engineer to design the modern canal network of the eastern bank, and by the ingenuity of this heterogeneous system that hinges on the distinct features of the eastern and western landscapes. One way to think about a case is as an epistemic object that a practitioner manipulates, in the way that a medical provider records, classifies, and compares clinical cases. However, as I learned on this boat trip, environmental scientists, civil engineers and infrastructure designers engaged with the case in a different way. Because they deal with objects with extensive spatial and geographic ranges, the act of a fieldtrip lets them travel into the case. This post unpacks the question: How does traveling within a case differ from the treatment of cases as objects to be compared? And how does this traveling shape our understanding of what constitutes a whole object? The fieldtrip to the Chao Phraya River was organized by a Japanese engineering consulting company, mainly for Japanese participants of a conference on flood mitigation held in Bangkok. The seminar was held by the Japanese International Cooperation Agency, with the goal of developing a new mitigation plan in the Chao Phraya Delta after the devastating 2011 floods. With the exception of myself, the participants of the boat trip were engineers, hydrologists, and computer scientists. More than half were based in Japan, visiting Thailand only occasionally for meetings and conferences such as this. The fieldtrip was planned by the consulting company, which acted both as a subcontractor of the infrastructure design and as a coordinator of the project, to facilitate a shared understanding of the “case” of flood management with which these various people were engaging. But what does “case” actually mean in this context? The project aimed to develop a new delta flood management plan by focusing on three major aspects: an assessment of the river hydrology, the design of basin-wide infrastructures, and the development of a flood forecast system. These diverse components were brought together to improve responses to future flooding in the Chao Phraya Delta. In the report that came out as the final product of the project, an imagined future flood is called the “design flood.” The report takes the actual 2011 flood as a template for the design flood because it is the largest flood in the recorded past. So the case of flood management here is a composite of a geographical entity, the Chao Phraya Delta, and an imagined flood, which is at once a probabilistic entity in the future and an actual event in the past. This is what the case looks like on paper. In practice the case is both an instance of intervention and the object upon which to intervene. Donald Schön indicated more than thirty years ago that “case” and similar words “denote units which make up a practice” (Schön 1983: 60). For him, a central feature of professional practice is the use of cases to frame a problem. Professionals draw analogies and make comparisons between the problem at hand and other cases they know from experience, in order to figure out how to deal with the current situation. Annemarie Mol also touches on this point in her entry to this series: “[a] case carries knowledge […] about an occurrence that, even though it may have happened just once, is still telling, indicative, suggestive” (2015). In short, the case is an opportunity to consider the very practice of intervention. In one sense, past cases gain their meaning in relation to a problem. But through comparison with past cases, the problem situation becomes one of the cases. Thus, the case of the Chao Phraya floods takes different forms, depending on what other cases practitioners conjure up. For the hydrologists, the “case” is a drainage basin of the Chao Phraya River whose hydrological characteristics need to be explored; for the engineers, it is a set of infrastructural interventions to control the river flow. The flood’s multiplicity (Mol 2002) is what made the fieldtrip less straightforward than I had initially imagined. It quickly became clear to me that hydrologists and engineers were not naïve enough to believe that going out to the field would allow them to reach a single, shared solution. In fact, rather than reaching a consensus among the diverse expert viewpoints, Miura-san encouraged the participants to explore their own questions on the boat trip. As the engineer’s lack of interest in the coherent whole suggests, what I found during the trip was rather complex relations between the situated and traveling viewpoints and the overviews of the delta water system, which itself is multiple. These complex relations resemble what Donna Haraway (1988) argues in her well-known essay on situated (and partial) visions. It was actually hard to see commonality between what we would see around us while sailing and what the hydrologists and engineers discussed and treated as “the delta” in other sites of practice, such as in labs, project workshops, and formal conferences. Their discussions typically focused on combinations of maps and diagrams on paper and PowerPoint slides that represented various aspects of the delta’s hydrological patterns. These artifacts were connected with water flows, topography, and precipitation observed in the “field” by automatic measuring devices. These discussions were occasions where I could observe them behaving like Shön’s practitioners: they conjured up cases they knew from personal experience or from the literature, and they relied on comparisons to highlight characteristics of the Chao Phraya case, or to examine the possibility of applying existing infrastructure designs to problems in the delta. However, in the boat trip the participants approached the case quite differently. In contrast to manipulating the case in the labs and conference rooms, on the river delta we found ourselves traveling within the case. During the fieldtrip, the delta became our entire environment. It was very difficult to imagine the delta and its water flows as the objects of practice, when we were literally encompassed by them. The conversation among hydrologists and engineers also reflected this fact and had a very different sensibility from those discussions held in other sites, where they were able to characterize the delta as an object of intervention by connecting it with other cases. In order to connect the present case with past ones, we needed to draw external relations between the two – a difficult task when you are located inside the case being examined. Instead, what we were doing on the boat was seeing the case from within. This inside view has some distinct characteristics. In the trip the vision of the entire delta such as maps and diagrams, which was so visible and salient in the labs and conference rooms, receded into the margin. 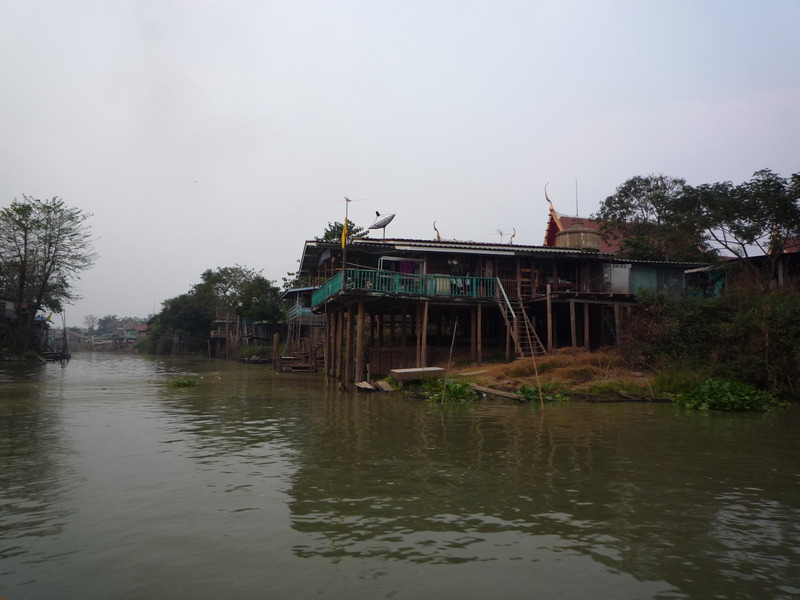 Instead our attention was constantly drawn to the smaller parts of the delta that we ran into and passed through, including the meandering canal network between the Noi and the Chao Phraya. But this does not mean that we were working on “smaller” cases or objects during the trip. The encompassing existence of the delta, taking the form of the watery landscape around us, as well as the project’s formal aim to formulate a plan for the entire delta, constantly drew our attention back to the overview of the delta gained in the labs and conference rooms. Thus, most of the participants never parted with maps, since they acted as essential artifacts to get back to the “delta as a whole”. Just like Miura-san did in his comparison between the meandering watercourses we traversed in the west and the canal grid in the east, we constantly moved between the scenes around us and what we imagined as the entire delta. This constant shift between the immediate scenes and the maps lead to another distinguishing characteristic of the view from within the case. On the trip, we encountered many scenes that we had never imagined in the conference room: Trains of huge barges dragged by tugboats; numerous quarries on the banks, which seemed to be providing building materials to the barges; an old, mysterious riparian town where most of the houses were built almost on the water (figure 2); a huge number of water hyacinths covering the surface of the Noi River; and the jungle-like canal network between the Noi and the Chao Phraya. These unexpected scenes provoked a lot of questions, some of which seemed only vaguely related to the issue of flood protection in the delta. But because we were surrounded by the undeniable material existence of the delta and its water, many of us were somehow forced to think more carefully about these seemingly marginal scenes. For example, my friend Omori-san, a hydrologist who had kindly invited me to the conference, was fascinated with the riparian commerce in the delta, which had a longer history than land transport. 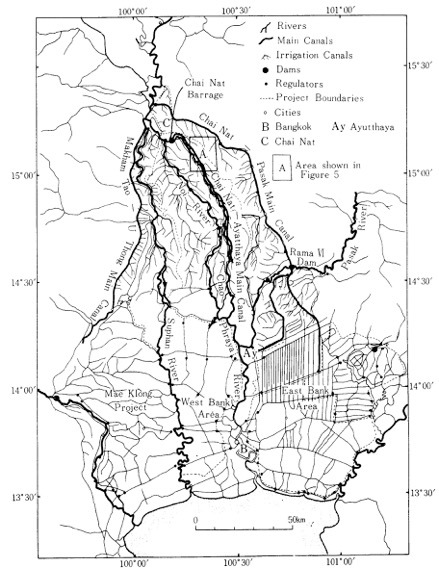 Using old hydrographs he found in a library, he started thinking about these networks of trade in relation to the broader changes of the river course over time, and ended up formulating a hypothesis about historical changes of water flow in which canal digging acted as a central factor that induced the change of the course of the river. The constant shifts between those unexpected scenes and the topographic overviews urged the hydrologists and engineers to see the delta as a dynamic and ever-changing entity. How did those diverse human and non-human activities, ranging from pre-modern canal digging, to modern infrastructure building, to the proliferation of water hyacinths, constitute what we were calling the delta? This is a dual question, because the “delta as a whole” denotes both an object we could see on the map and the environment we were traveling through. Eventually this movement led both Miura-san and Omori-san to rethink the specific dynamic forces that formed the present delta. For Miura-san, the civil engineer, this took the form of Homan van der Hiede’s engagement with the delta through infrastructure building, while for Omori-san it was the historical change of the river course brought about by both human and natural forces. Apparently, their inclination toward historical explanations was at least partly the product of their conversations with me, the anthropologist who acted as a guide to the social and cultural background of the local area. These engagements with the delta seem to explain why fieldtrips are often given a place of importance in civil engineering and water management projects. It is not because such trips allow practitioners to encounter the “true” or “real” delta, but because these encounters push the practitioners toward more experimental thinking, as they face the constant back and forth of unexpected scenes and the imagined whole of the case. Of course, at the same time, this whole is not a singular entity. Just as the professionals are always engaging with a multiple case when they meet in the conference room or laboratory, during a fieldtrip they conjure up different versions of the whole. For the hydrologists, it is a primarily river network and drainage basin; for the engineers, it is the total of infrastructures, and for me, when acting as their guide, it is a historical landscape. What, then, can anthropologists and ethnographers learn from this version of a fieldtrip? There are certainly commonalities with our own fieldwork practices. An anthropologist also treats his/her case both as an object of analysis and a place to travel and live. As Marilyn Strathern notes, this distinction corresponds to “the desk” and “the field”: two central sites of ethnographic practice (Strathern 1999). Many anthropologists treat the field as more “real” than the desk. Engineers and hydrologists, however, usually do not take such a view. For them, the archetype of the real is based on data gathered in the field by measuring devices. Because the cases presented in labs, workshops, and conferences are tightly connected to these data sets, they are more real than the practitioners’ own travel experiences, which do not in themselves yield what they think of as data. However, partly because of this marginality in their practice, fieldtrips have significance for engineers and hydrologists as sites for experimental thinking. At the end of the trip, we landed on the bank at a closed sluice gate in the upper delta. We found the final surprise there. 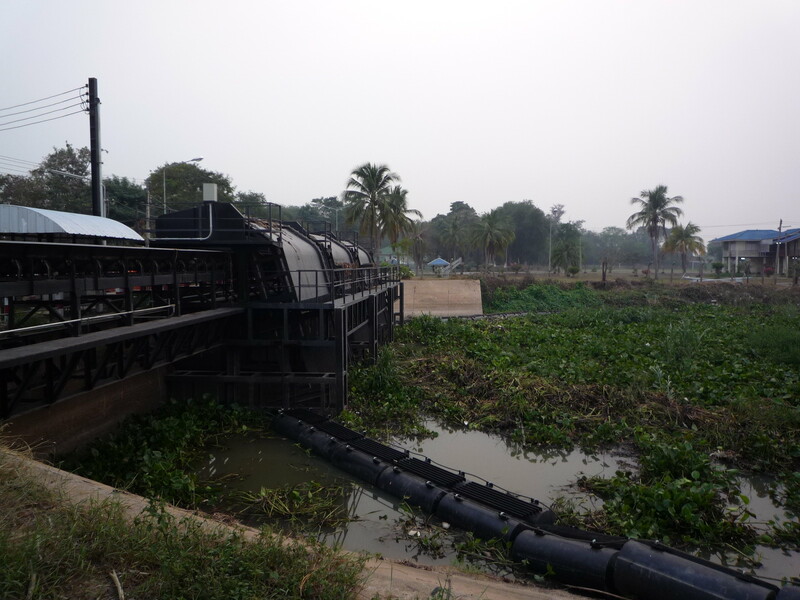 Attached to the sluice gate, there was a huge machine to collect water hyacinths gathering on the water surface (figure 3). A Thai colleague explained how water hyacinths, which were introduced long ago as decorative plants, had now become an environmental threat and a hindrance to infrastructural operations. Such plants never appeared in the reports or in conference room discussions. But momentarily, at least, as we paused near the sluice gate at dusk, the hydrologists and engineers quietly reflected on how this multispecies presence might affect the delta and its floods. This scene and conversation with them also led to my own experimental thinking, as I envisioned a cyborgian infrastructure consisting of plants and sluice gates (Morita 2015). This wild image sheds light on the anthropological meaning of traveling within the case. While often overshadowed by the issue of the “real” nature of the field versus our representations of it, the field has also been an experimental space for anthropology. Journeying through these fields, anthropologists and their interlocutors have become fellow travelers, encountering surprises and engaging in partially connected experimentations. Haraway, Donna. 1988. “Situated Knowledges – the Science Question in Feminism and the Privilege of Partial Perspective.” Feminist Studies no. 14 (3):575-599. Ishii Yoneo. 1978. Thailand: A Rice-growing Society. Honolulu: University Press of Hawaii. Japan International Cooperation Agency, CTI Engineering International, Oriental Consultants, Nippon Koei, and CTI Engineering. 2013. Project for comprehensive flood management plan for the Chao Phraya river basin : final report. Japanese International Cooperation Agency. Mol, Annemarie. 2002. The body multiple: ontology in medical practice, Science and cultural theory. Durham: Duke University Press. Mol, Annemarie. 2015. Exemplary: The case of the farmer and the turpentine. Somatosphere. Morita, Atsuro. 2015. Multispecies Infrastructure: Infrastructural Inversion and Involutionary Entanglements in the Chao Phraya Delta, Thailand. Ethnos. Strathern, Marilyn. 1999. Property, substance, and effect: anthropological essays on persons and things. London ; New Brunswick, NJ: Athlone Press. Atsuro Morita teaches anthropology at Osaka University. He has done ethnographic research on technology development in Thailand focusing on how ideas, artifacts, and people travel in and out of the country. He is currently co-convening a Japan-Denmark collaborative project titled Environmental Infrastructures funded by Japan Society for Promotion of Science. His research has been recently published in Science, Technology and Human Values, HAU: Journal of Ethnographic Theory (here and here); and Ethnos (forthcoming). Morita A. Traveling within the Case. Somatosphere. 2016. Available at: http://somatosphere.net/2016/traveling-within-the-case.html/. Accessed April 23, 2019. Morita, Atsuro. 2016. Traveling within the Case. Somatosphere. http://somatosphere.net/2016/traveling-within-the-case.html/ (accessed April 23, 2019).